Disclaimer: I had watched seven John Carpenter films in a row immediately prior to sitting down to this. I do not think this affected my judgement, but I don’t know for sure. Wreck-It-Ralph is a hugely fun movie. A heartfelt nod to the arcade games of yonder, a protagonist echoing without plagiarising Toy Story, and some sentimental and hilarious moments to show that Disney Animation Studios could still compete with Pixar. Which is all what made Ralph Breaks The Internet so disappointing to me. The basic plot is that Ralph (John C Reilly) and Vanellope (Sarah Silverman) must enter the internet to retrieve the steering wheel for Vanellope’s game. Here they encounter both the scourges and the joys of the internet, from pop-up ads to online gaming. What this film really felt like was a chance to advertise the internet, a largely administrative hellhole. Where the likes of Pacman and Sonic were celebrated in the first film, here it’s Ebay and Lad Bible. I still enjoy Ralph and Vanellope as characters, but if the plot is going to most closely resemble The Emoji Movie then I can only ever feel those same levels of nausea and bored contempt watching it. A low point in the film is when Vanellope goes to Oh My Disney to fawn with other princesses and share tired or unfunny jokes. I thought of Steamboat Willie in the opening titles, I thought of Ralph becoming a ‘viral sensation’ among mindless office droogs, I thought of how far we done fell. Another issue was the stakes here. 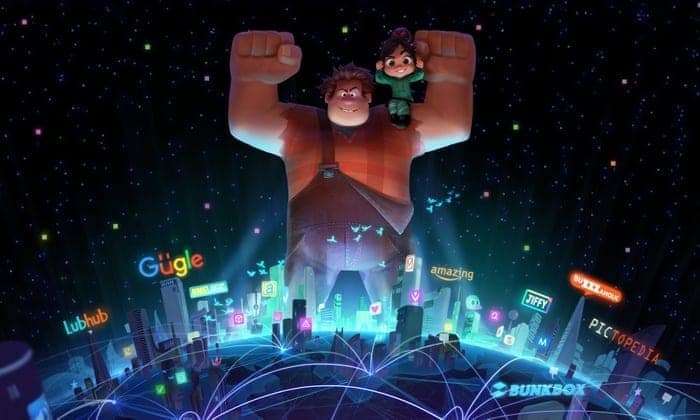 In Wreck-It Ralph an entire community of beloved characters was on the line in a poignant way. Here the stakes feel thinner, the attempts at pathos more jarring. Just as in Ready Player One watching a largely online only presence already removes an element of threat, and a million and one cultural references won’t plug any plot shaped holes. The animation is as good as ever if not better, there’s even a couple of funny lines in there. Yet this all still feels like Disney at its most mercenary, and what I can only hope spells ‘GAME OVER’ for what was a once promising character and environment.